After the return of the House of Orange in Holland in 1813, there was a revival of interest in the Dutch 17th century masters and a move away from French influence which had previously dominated the visual arts. 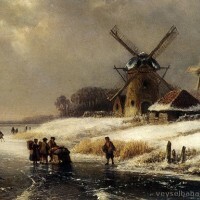 This was encouraged by Willem I who wanted a national school of painting to flourish again. Exhibitions of contemporary artists were promoted, the profession of painting was stimulated and the number of artists increased quickly. L.J. 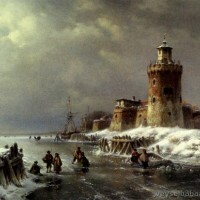 Kleijn was born on 14th August, 1817 in the town of Loosduinen, close to The Hague. 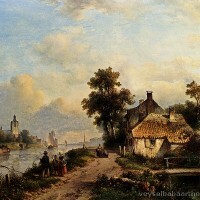 Little is known of the artist's early training but he must have shown great promise as he was admitted to the studio of the great master Andreas Schelfhout (1787-1870) in The Hague. 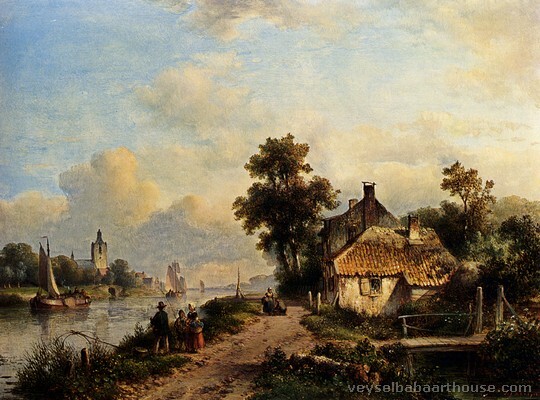 Schelfhout was one of the most important landscape artists of the Romantic School of painters and was a much sought-after teacher who had at least 30 students. Kleijn absorbed as much as he could whilst at Schelfhout's studio, learning the master's painting techniques and also using the same subject matter. His finest works are carefully finished with great attention paid to detail. 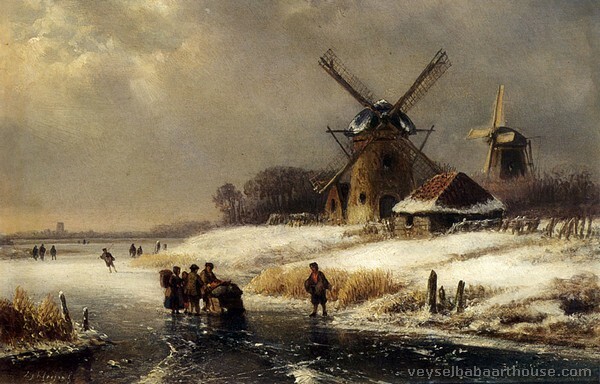 He depicted both summer and winter landscapes and usually found his motifs by the water's edge. Using a warm and rich palette Kleijn evokes a vision of a timeless unspoilt Dutch landscape in this magnificent painting. The artist uses strong diagonals and a low horizon line to lead the eye to the view of the distant city. 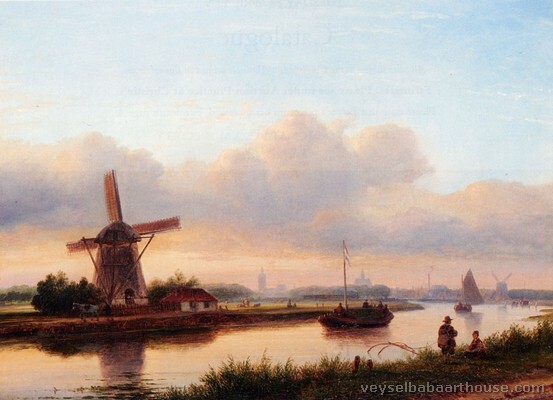 He combines the pastoral foreground with the windmill, indicating the rural history of Holland, with the hint of the more 'modern' Holland in his suggestion of the city in the background. The calm waterway and the casual angler add to the general feeling of peace and tranquillity. 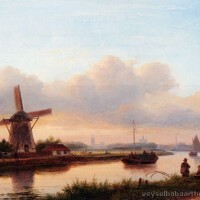 Kleijn was a highly regarded and successful artist who exhibited in The Hague and Amsterdam between 1842 and 1894. His patrons were the wealthy middle class citizens of the area in whose homes his work took pride of place. 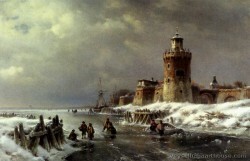 The artist died on 11th March, 1897 in The Hague.